Winter chinook salmon season is here and so is our "Winter Chinook Charter Special". Like we do every year,we are offering fully guided winter fishing charters at a great rate from January 15th to March 31st! This year, we are offering full day trips (8 hours) for a great price. In the past, we have done a half day special as well, but we feel the full day trip offers the best experience in the winter months. A full day trip allows us to fish where we want, work the tides, move around a bit, and have the gear in the water longer to increase the number of hook ups! Have a look at this video we shot in February 2015, this is what we are targeting and the area we typically fish in the winter. The scenery is worth the trip alone! The beauty of the winter is the lack of crowds, stunning scenery and some of the best eating salmon of the year. On our charters no previous saltwater fishing experience is required and we supply all the fishing equipment. Our boats are rigged to perfection with new Yamaha Outboards, Islander Reels, Scotty Downriggers and all the hot gear from Gibbs Delta Tackle! In addition to trolling for winter chinook salmon, crab traps will be dropped for Dungeness crabs on the way to the fishing grounds. 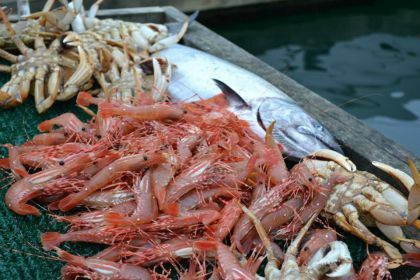 If weather and fishing locations permit, we can also drop traps for spot prawns! 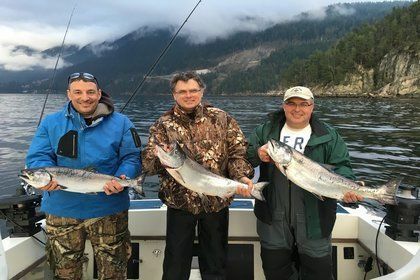 If you are looking to make a weekend of it, we can combine 2 days of fishing and a night at a seaside cabin at the Union Steamship Marina on Bowen Island. A 2 day package with a night on Bowen Island starts at $449.00 per person. Makes for a great quick fishing getaway for a great price. Please get in touch with us for more charter and accommodation info!